Department of Main Roads, New South Wales, DMR, NSW, Head Office, HO, Sydney, Castlereagh Street, Pitt Street, Campbell Street, Belmore Park, the P&S Cafe, West End Hotel, Chamberlain Hotel, EMI, Commonwealth Bank, Goulburn Street, Brickfield Hill, Voucher Examining, The Colony, Chinatown, Hotel Sydney, Central, the Tivoli; all this names bring back memories for ex-DMR staff, old and older. Dedicated to all our mates who have left this life. The P&S Cafe, West End Hotel, Chamberlain Hotel, EMI, Commonwealth Bank, Goulburn Street, Brickfield Hill, The Colony, Chinatown, Hotel Sydney, Central, the Tivoli, Chew and Spew, Chambo, Chamberpot; all these names bring back memories for ex-DMR staff, old and older! 2018 DMR Reunion - Saturday, 1st December, starting at 12 noon. Trevor Mace held successful DMR reunions in 2015, 2016 and 2017 at the Civic Hotel, Sydney. Contact Trevor on our FACEBOOK group after the end of October. 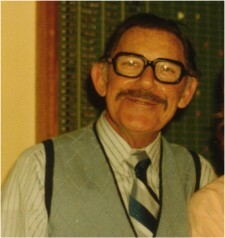 Howard handled all the clerical work in the Head Office garage. After ten and a half years with the Department (I have a tie-clip to prove it) I would like to say farewell in this column to those whom I did not contact personally. Eleven years ago, I decided to become either a Brain Surgeon or a Space Scientist, but after a medical examination, I was informed that I had so many stones in the kidneys with an abundance of gravel, that I would be more gainfully employed with the Department of Main Roads. With many promises of doing a job, and a great deal of that substance found in the pens adjacent to the Spanish Bull Rings, I was accepted by the Department. I commenced in May, 1968 as an Office Assistant, a position which never left me. Being a person of high standards, which I gained in my younger days at "Thommo's" Two-Up School, Randwick Races, The Rock and Roll Hotel at Woolloomooloo and Kings Cross Terrace Houses, I was able to remain in the same job in the same section for the whole period. One of my greatest successes was winning the "Agitators Paddle", three times, against the best "Stirrers" in the business. This in itself requires great dedication and a motivation to become intolerable. To all those friends who so graciously accepted my money from losing football wagers, I say "thank you" from the bottom of the barrel. To my other friends, I would like to thank you both, for your persistent and menacing phone calls that made me appear so important. 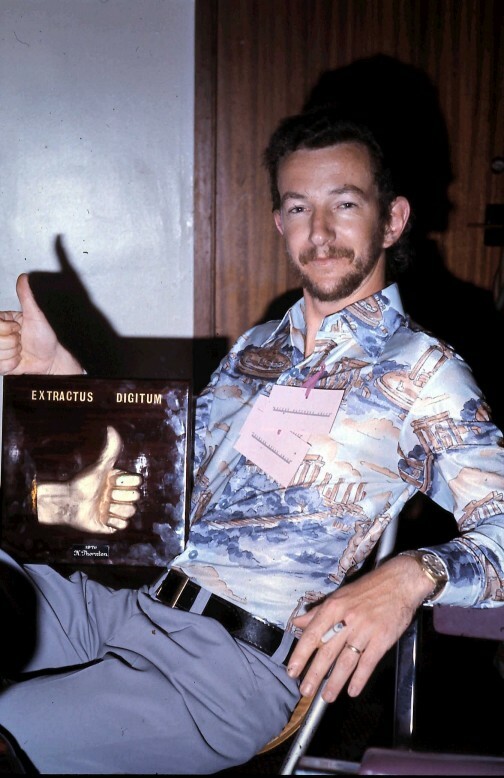 The Superanuation Board's Medical Officers and the Top Brass have a lot in common - they never understood me. Anyway, I leave on vacation with the knowledge that automation never changed me from the same Office Assistant in the same Office despite the progress inflicted upon me. Many people came and went through the less than majestic entry doors of the DMR in Castlereagh Street, Sydney. And of those people, a fair proportion left their mark on our lives, one way or another. Head Office had more than its goodly share of characters. The greater majority enriched our lives, or they did this young bloke, who walked into the ground floor foyer in February, 1965 for his interview. - My story is continued on a new page. There are countless stories to relate about the DMR; the people, the work, the building. Many appeared in the Recreation Club magazine, THE HIGHWAYMAN and you'll find some of these available via PDF files below. 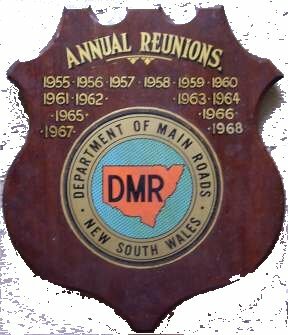 Relatives looking for information on family members who worked for the DMR are welcome to email me or snail mail via PO Box 781, Katoomba NSW 2780. From the late 1960s onwards, I often carried a camera so you'll find a spread of photos here over time. Photos (or negatives and slides) and stories are welcome from you, naturally. If you don't have the facilities to scan or copy these I can do so and return the originals to you. Damaged photos can also be restored. You'll find some sample photos here. 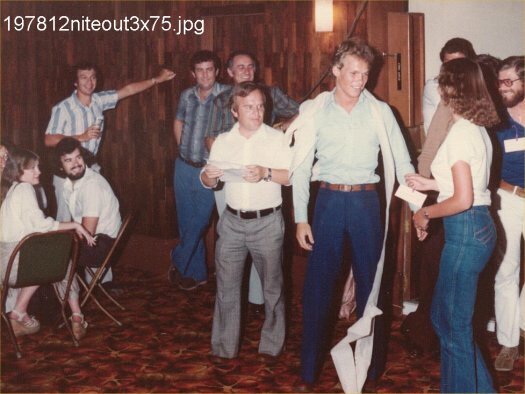 Higher resolution files are available as .jpeg attachments to ex-staff members who can identify those within the photos. More than 500 photos have been digitized and are available. ALL donations of photos and ephemera are welcome. I've also received offers of The Highwayman and Main Roads magazines. However, due to their weight, it's not feasible to post copies. You'll see a list of simplified QUICK LINKS to the right. If you have any questions regarding employees who left the DMR after 1985, please email me or snail mail via PO Box 781, Katoomba NSW 2780. Please include your name in the email subject line of emails. I can't help you with anyone who left prior to 1985; use the RMS contact page. Please note that I CAN'T help with RMS ROADWORKS QUERIES; sorry! Click on the thumbnail images below for A4 sized, printable PDF images. Sign in (or join) Facebook at www.facebook.com and either do a search for me, or a search in GROUPS for Department of Main Roads, NSW, Australia, and then follow the prompts. If you haven't used Facebook before, contact me direct if you have any problems finding our page. 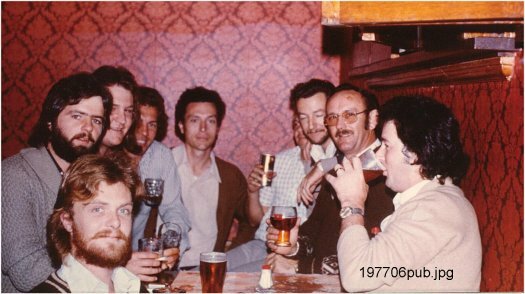 You'll find a running PUBS REMEMBERED discussion on the FACEBOOK page. Q. From where did the DMR logo/symbol above originate? A. No ones knows. It was replaced in the 1980s by an in-house design. The best known expression of the symbol was on the side of the 8-floor Castlereagh Street annex building. The scan above is taken from a jacket patch. These were thrown out when the design was superseded but I managed to find a few. Q. Is there a published history of the DMR? A. 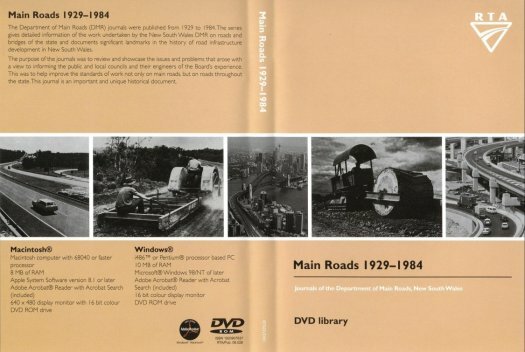 Yes, The DMR published THE ROADMAKERS, in 1976 ISBN 0 7240 0439 4 This is a comprehensive history of roadbuilding in NSW. It includes figures, numerical and financial, on both the work carried out by the DMR and monies spent, and staff figures. Q. Any other sources for information? A. MAIN ROADS, the in-house journal, issn 0025-0597, and THE HIGHWAYMAN, the Recreation Club in-house magazine. Q. 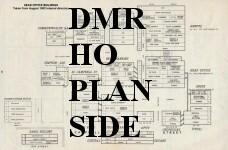 Was there an inspection of the DMR HO site prior to rebuilding? A. See Australasian Historical Archaeology 17, edited by Mary Casey, paper Local pottery and dairying at the DMR site, Brickfield Hill, Sydney (Mary Casey). I'm not sure if this was before or after the DMR. Q. Can you give a timeline of the formation of the DMR? All information up to 1970s from THE ROADMAKERS ('TR' in text, see above). 1924 - The Main Roads Act was assented on 10th November. 1925 - The Main Roads Board of New South Wales came into being on 1st January. The physical board consisted of a president and two members. An organizational chart for 1927 appears on p95 of TR. 1926 - The Board rented floors one and seven in Citroen House, located at 301 Castlereagh Street. I believe the corner of Goulburn and Castlereagh Streets at that time was occupied by a motor dealer (in the 80s the DMR donated it as a park). The lease of these floors cost $2322 per year. This worked out at about 23c per square foot. 1928 - In March the Board moved to 309 Castlereagh Street, the four story fireproof building well known to all employees who at one time or another worked in Head Office. Originally the street frontage was occupied by a printer. The leasing rate was double the cost in Citroen House. Staff levels in 1928 were around 340 salaried officers and 3400 employees statewide. By 1972, these numbers had increased to around 3600 and 10,300 respectively. 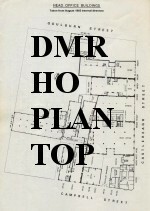 1989 - DMR and DMT combine in January to form the RTA. DIETHNES GREEK RESTAURANT, Pitt St. What happened to my mate Nick Saivanidis, who later opened the Kakavia Greek Restaurant at 458 Elizabeth St, Surry Hills, with chef Chris Michael? Update: I heard from Nick's son in 2009. Join Diethnes on their FACEBOOK page. 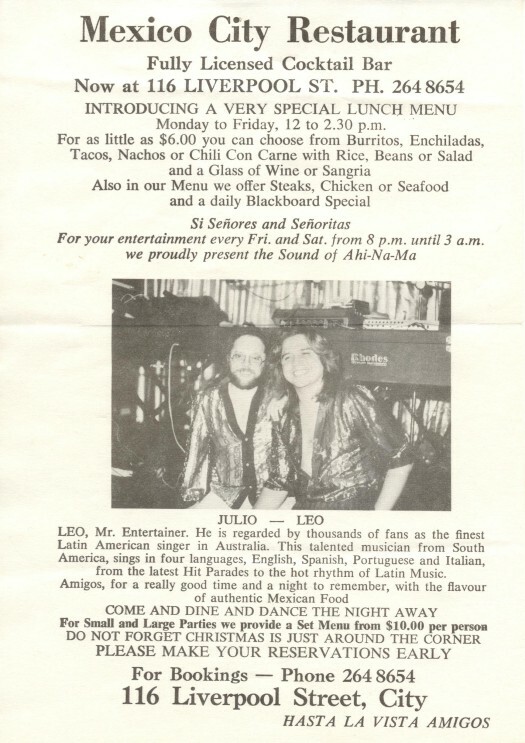 MEXICO CITY RESTAURANT, George St. in the Anthony Hordern's Building, and later Liverpool St. Brilliant food and sangria! MANDARIN CLUB, basement smorgasbord was the place to eat in the 1970s. RSL and two doors up, HOBBYCO's original 2 level toy and hobby shop. 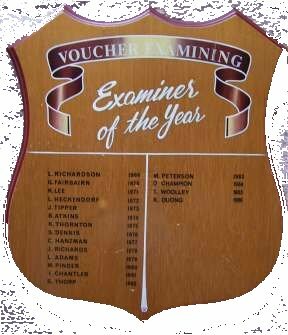 Voucher Examining, section 'Examiner of the Year' plaque, saved during the ACE Pitt Street move. Click on the photo for a closer look. Kevin "Rocker" Thornton was the first winner. Last heard of living north of Gosford. PLEASE let me know of any faulty links! Hopefully all updated to RMS, 2013. * DMR ARTEFACTS in private hands, see on this page. * DMR Film Library, Auburn [Lidcombe] Some are available on Youtube. * DMR MAIN ROADS journal. Now available on DVD or as a download. You can order online at the NSW Government Online Bookshop. Alternatively, phone the Transport Library on (02) 8849 2913 or email library@rms.nsw.gov.au . * DMR OLD & BOLD PHOTO ARCHIVE 122 b/w DMR photos collected by Joan Fairbairn now online! Click on the thumbnails; each has a reference number. If you can identify people, quote that number and email me. * From the skies  aerial photos of Sydney, 1943, 10 x A1 posters OR CD. You can order online at the NSW Government Online Bookshop. Alternatively, phone the Transport Library on (02) 8849 2913 or email library@rms.nsw.gov.au . * The NEWELL Highway – Named after a pioneer road man. * Shutterfly DMR site, set up for future use in case these pages disappear. * Paul's Aussie Expressway site. The annual re-union plaque found by a retired employee in a garbage skip during the move out of 309. What's the name of the pub on the corner of Elizabeth and Hay Streets? This was taken there in 1978. PDF files listed below. You can print these easily. I've noted branches covered, but not names of retiring or resigning employees included in the articles. 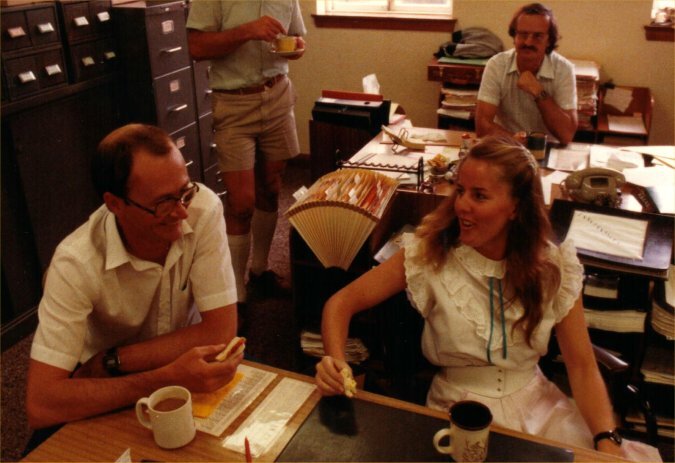 Staff Section, 1985. Chrissy Best and [John] Shaun Stitt with Frank Gall sitting at the rear desk. At a guess the person standing up may be Neil Jackson. Thanks to Brian Goldwater for filling in the details. Hosted by CB&M, Blue Mountains, NSW.